National Simultaneous Storytime will take place this year at 11.00am on Wednesday 24 May. Kids and adults will get together at that time to share The Cow Tripped Over the Moon by Tony Wilson and Laura Wood, published by Scholastic (2015.) You can read my review of this book here. Here’s another review and a heartfelt message from Barbara Braxton at The Bottom Shelf. I love it when ALIA select a book for NSS that is great for sharing with older kids too. 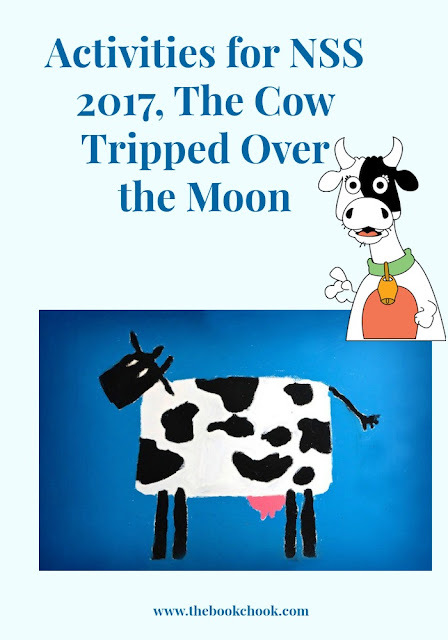 Primary kids will enjoy the humour of The Cow Tripped Over the Moon, and I believe many will also appreciate the clever format of different moon attempts, the rhymes and interesting vocabulary - It seems a moon clearance Takes great perseverance - the jaunty rhythm, the disasters and the satisfying ending. Note to read-alouders: Do make sure you read this one through several times so you don’t stumble on any words. The rhythm works, but I definitely needed to practise. *** Can you pat your knees while you say that rhyme aloud? *** Here’s Teddy Rock singing Hey Diddle Diddle on ABC Splash. *** What are some rhyming words we know? Let's make a list! *** The author of this book, Tony Wood, wrote lots of variations with the same rhyme and rhythm patterns as Hey Diddle Diddle e.g. A cow jumps over the moon. Can you march and say that verse aloud? Can you sing it or dance it? *** Just imagine a cow attempted to get over the moon with a propellor hat. How did the cow get such an idea? Would a propellor hat really work to lift a cow? What special circumstances might help the hat to work? *** Can cows really jump? Can you jump? What animals do you know that can jump? Think about how those animals look. Is there something you can tell about an animal’s ability to jump by looking at its legs and body? *** Here’s a colouring page of a cat playing a fiddle, and lots more characters to make into paper and stick puppets for re-telling the rhyme or the story. *** How do you think the cow felt in the story? Would the cow be happy about the little dog laughing? Why or why not? *** Choose one of the book’s “verses” and make up a body percussion to go with it. Try saying your verse aloud and doing your percussion at the same time. *** If you had to get a cow over the moon, how would you do it? Explain to someone near you. Design a machine that would be able to send a cow over the moon. *** Would you expect a dish, a spoon, a cat, a dog and a fiddle to be present at a moon-jumping attempt? What might the back story be that brought them there? *** What do you think the cow’s name might be? How about names for all the other characters? *** What if other animals saw the cow and decided to make an unusual attempt of their own? For instance, here’s a horse that decided to leap over Saturn. Can you create something about an animal that attempts something really unusual? What happens next? ***Have you ever tried and tried, time and again, until you managed to do something? What was it? * A paper plate and a wooden spoon become easy puppets for story re-telling. You could add other characters with these paddle pop stick puppets. * 3 Dinosaurs has three different downloadable free PDF Hey Diddle Diddle Packs. Part 2 of the pack has coloured puppets and other activities. * Kidspot have a free downloadable PDF of the Hey Diddle Diddle characters and video instructions on how to make a shadow puppet story. * Here are some craft ideas from DLTK. * ALIA have some PDF resources on their NSS webpage. * People all over the world have created artworks about cows. 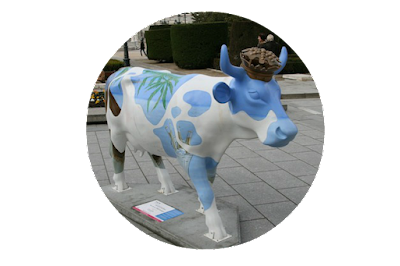 Some of them paint cow statues with amazing patterns and designs. 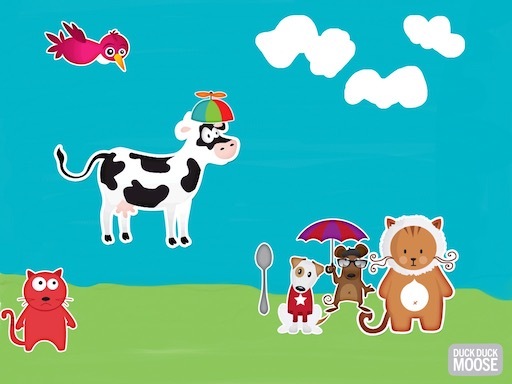 Create your own cow artwork. 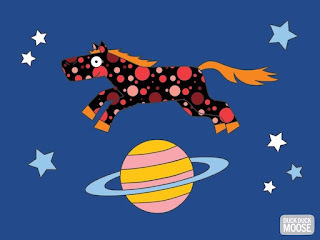 Do set aside 11am on Wednesday 24 May 2016 as adults and kids across Australia read The Cow Tripped Over the Moon. Check with your local school or local library for an NSS event. Or gather some friends together and join in a celebration of reading and cows before, on or after the date! You might also be interested in earlier NSS books and activities: 2016, 2015 2014 and 2013.